Most of us are familiar with the story of David and Goliath or David and King Saul or King David and Bathsheba, but what about the story of King David and Mephibosheth? He was the son of Jonathan and Grandson of King Saul of Israel. When news reached Gibeah that they had been killed in Gibeah the nurse looking after the five year old Mephibosheth scooped him up to flee from the palace and accidentally dropped the boy, crippling him in both feet! Although he features in just one throwaway verse in 2 Samuel 4 it sets the stage for something great to happen. Of course it is only David and Jonathan that actually know about this oath because it was made when they were trying to stop Saul from killing David. So David didn’t have any pressure from anyone about acting on this oath. It was David's responsibility before God to make good on this oath, so he does in 2 Samuel 9. I think it may have been the understanding here that when he asked the court if there was anyone left alive of Jonathan’s household, they would be assuming that it would be to enact his right as king to remove the bloodline, to kill off any future attempt upon his throne. We can only guess at motivations for some things in this story because they are not explicit, but I think there are some things that we can read between the lines.Mephibosheth it would seem is in hiding. He is pretty much the lowest of the low in society. He is no use to anyone, crippled in both feet so not able to contribute to a household and being kept by someone who might be able to use him at some point for some possible political or power advantage at a later date. Basically he is in exile in a place called Lo-Debar which couldn't be further from the power centres of Jerusalem and Gibeah if it tried. Now perhaps the moment of this advantage has come and Ziba, faithful trusted servant of King Saul, appears in the courts only to find that David wanted to show kindness to Mephibosheth. David is told of the location and sends people to go and get him. At this point put yourself in Mephibsheths bandages, how would you feel having kept well off the radar a unit of the Kings guard appear with a message for you to accompany them before the King? You know that you are the last surviving member of the previous Kings bloodline you’re going to start to sweat a little. So when he comes before David he prostrates himself on the ground, almost begging for mercy before a sentence or judgement has been passed. David says “Do not fear”, those three so important words in the Bible that so often accompany great news. The only thing is when someone last said that to you in an important situation, how did it make you feel. I recently had this at work, one of the company directors wanted to meet with me. Seeking some clarification I asked if they could tell me what the meeting was about, I was told it was nothing to worry about! I couldn't make the meeting that was arranged so a conference call was arranged for after the weekend, but it's OK there was nothing to worry about! Do you think I worried through Friday, Saturday, Sunday into the Monday, despite being told it was nothing to worry about I couldn't help myself. Having taken the call it turns out it was nothing to worry about - if only someone had told me! It was BAD NEWS for Ziba. Again, we don’t have a total insight into his motivations but it seems that with Saul’s death the opportunity had come for him to benefit. He had been left with all the dead King's lands to manage, and it isn’t beyond comprehension that he may have kept back profits, at least some of the riches from the sales of the crops grown on the land. It’s not often we hear of a servant who can afford to father 15 sons, which one would assume were by multiple wives (or one exhausted wife) and additionally own 15 slaves. It seems that in the years between Saul’s death and this moment he had made himself a very comfortable life. As David makes this declaration I can imagine the colour draining from his face as he hastily calculates how he can continue the lifestyle that he has become accustomed too. Effectively he has put himself and his sons into servitude for this nothing of a man who is lame in two feet. The GOOD NEWS is for Mephibosheth. Today when we consider the idea of having tea with the Queen this is a big deal. When people go for an audience with the Queen they dress up in their finery just to share a garden with the Royal family. It’s a once-in-a-lifetime experience and is one of the highest honours that many people will receive. It’s awarded to those who have done certain things in special circumstances or who have been leaders in their field of industry. What Mephibosheth is invited to is so far beyond this. Mephibosheth is effectively being adopted into David’s court, almost like being adopted into his family. From a man who is in hiding, who cannot work and fend for himself and having the shame of having to live in another man’s house and kept in case one day there might be an advantage to him still being alive – to being granted one of the highest honours of the Kingdom itself. He was to live as a Son of the King. This is such a picture of grace. He was the true heir to the throne, by blood, and David would have been well within his right as the anointed King of Israel to kill him and his wife and child so there could be no claim to the throne. In the law of the kingdoms surrounding Israel that were much more established, this is exactly what would have happened. Instead Mephibosheth is shown unmerited favour by David and elevated over everyone except David’s own family. He is to eat at the table of the king, his provision for other needs is to come from the work of his servant Ziba and his land. He has received a rich inheritance. Mephibosheth himself has done nothing to earn this position. He is still the cripple he always was, nothing has changed in himself. He did not have to earn the honour, the honour was given to him because of who his Father was. 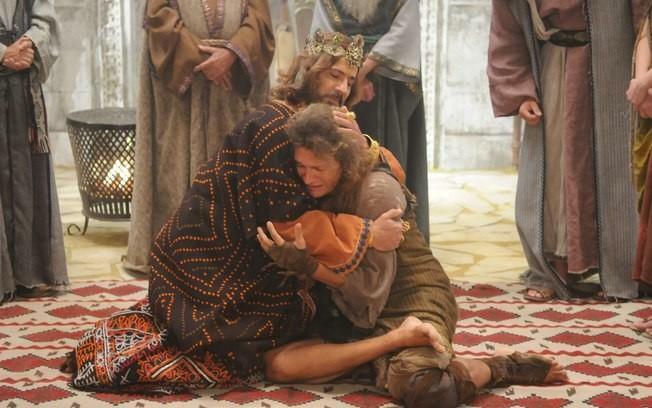 It was solely because of David’s love for Jonathan and the oath that he made that saw this event happen. When I read the Bible I have to admit that I try and find people that I identify with. In this passage I would love for it to be David that I can identify with. Who wouldn’t want to identify with one of the most revered men in the Bible? Sadly, I have less of the royal bearing and with my gout, I identify more with Mephibosheth here, and that’s OK too because this story shows us something deeper. Just as this shows us a picture of David's respect for his oath he made in the sight of God, it also reflects the nature of our relationship with God. We are all invited in a similar way to Mephibosheth to come to God, not because he wants to punish us, or to destroy us, but because He wants to invite us to have all the benefits of being part of His family. Jesus says in John 8v44 “You belong to your Father the Devil”. That is our natural place, and as such, the conquering King would have the right to kill us. Mercifully he offers us adoption into His family, makes provision for us and cares for us. This is not because of anything that we have done, but because of His Son, Jesus and we are given grace and shown unmerited favour. Perhaps this is something you haven’t ever heard before, perhaps you’ve heard it many times, but right now God is offering His love to you and all you have to do is accept. This is an open invitation to accept like Mephibosheth. Perhaps this is an offer you accepted a long time ago but you have forgotten that you are an adopted son of the Lord God Almighty and that you have been invited to sit at His table and get your inheritance. Take joy that this is something we accept once and the sonship of God is given to us and rejoice in your position at the Kings table. Now it’s not strictly part of this story, but in the next chapter David sends condolences to the Ammonite king when he hears that his old ally had died. These people see this as suspicious, doubt his intentions and humiliate the messengers and David. The offer is rejected and eventually as you read through the passage leads to the death of 50,000 men. Sign up for our free fortnightly newsletter to get all the latest reviews from One Man In The Middle. Copyright © 2019 One Man In The Middle. All Rights Reserved.